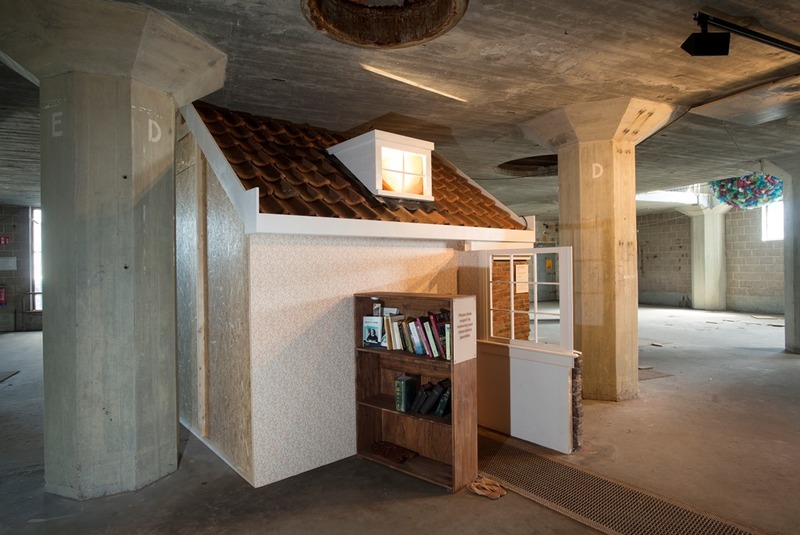 From June 27 until October 4 2015 Museum De Lakenhal in Leiden, The Netherlands, presented ‘Global Imaginations’. 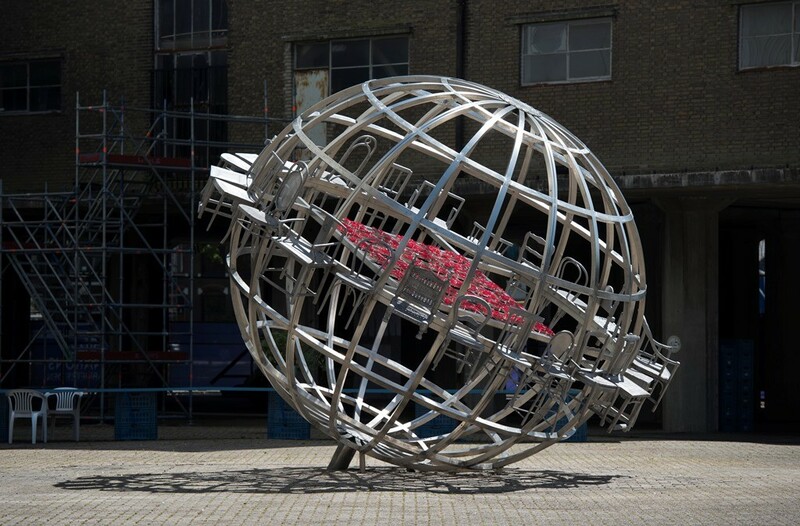 Leading artists from all continents presented their vision of the globalising world. Leon Wainwright looks back on this important exhibition. 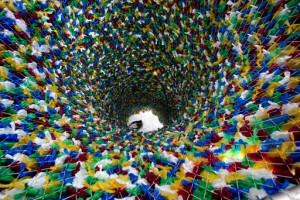 Pascale Marthine Tayou, Plastic Bags, 2001-2015. I didn’t get to see the exhibition Global Imaginations until quite late in the summer of this year, if it could still be considered summer at all. The former industrial site that houses the show was dripping with rain. As I explored the place and tried to dodge the puddles in the cobblestoned courtyard between buildings, I just kept getting wet, from above and below. Drying off later at the entrance hall, I saw that someone had written in the visitors’ book how ‘the whole place needs a wrecking ball’. That’s mean and it misses the point for at least two reasons. First, the mill, for all its leaking dilapidation, is a vast, sublime ruin which matches the exhibition’s equally large scale and ambition. Indeed, there is no better venue in the Netherlands for evoking a sense of where debates on art and globalization ought to be heading (into a more sober and damp place of reflection from which the optimism surrounding the arrival of ‘global contemporary art’ can be viewed with a sharper and more critical vision). Second, it’s obvious that the wrecking ball is already here – it’s the exhibition itself – and the wrecking has already begun. What’s on show breaks through the walls that have separated and ordered art’s histories, drawn along national borders and the hierarchies of (former colonial) centres versus their dependent peripheries. It is finishing off the destruction of the boundaries that have cloistered scholars and authorities on art in their deliberations about what counts as ‘contemporary’. But, more than that, the pendulous antics of the exhibition are bearing results for art’s audiences. It is the work of a large demolition squad of artists and curators who are dead set on tearing down the divisions between art’s privileged viewers and a wider, underestimated and now somewhat rain-drenched public. 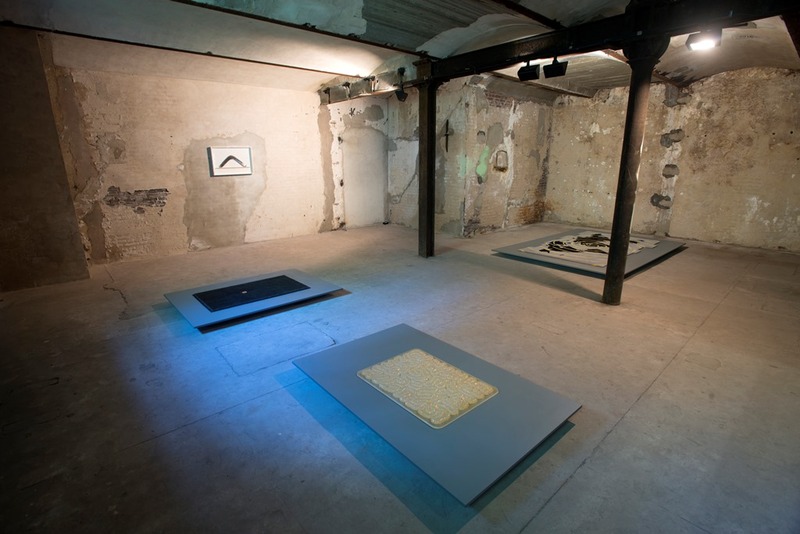 Meschac Gaba, Citoyen du Monde, 2015. Mark Dion, The Natural Sciences, 2015. The coupling of art and destruction was the theme of an event held at London’s Africa Centre and various other locations across the city (the Institute for Contemporary Art; Carnaby Street, etc) from 9-11 September, 1966. This was arguably the first international gathering of artists in Britain of the early post-Second World War period, flanked by scientists and poets. To characterize briefly the internationalism of the ‘Destruction in Art Symposium (DIAS)’ it may suffice to say that its internationalism was expressly not of the Modernist kind. The symposium looked back in anger at the pretense of Modernism, with its claims to be mindful of a world of differences and disadvantaged communities, all the better to improve their lot. Essentially, in their Happenings, they tore things up, and down. They spilled blood (Hermann Nitsch), smashed a piano (Ralph Ortiz), promised a strip tease that barely happened (Yoko Ono), painted and erased a line, divested actors of their newsprint clothing (in John Latham’s play Film) and counted coins (Al Hansen). As they did so, Third Worldism and the decolonization process was being felt at the heart of an empire. Guyana’s independence was only four months’ old; for Barbados, Lesotho and Botswana it came later that year. Britain became a maelstrom of migration, exile and displacement, as newly arrived citizens from Africa, Asia and the Caribbean felt resentment and backlash from a nation that couldn’t accept that it was losing its status as a hallowed global power. All this would be re-conceptualized with some very Dadaist tools at DIAS. Artists spoke about destruction as the only possible resort for art, while Britain’s changing and restless body politic became a synecdoche for a global vision in flux, or in nosedive. What emerged from the debris of destruction, it was said, were patterns in the fragments. A pleasing mess followed the collapse of a world fashioned only for the benefit of the few. Ghana Thinktank, Monument to the Dutch, 2015. Very nearly fifty years later, and if that chapter of art history seems long behind us, it is being written again in new ink. Talk of the decolonization of art has been translated into a more differentiated although not exactly purposeful language, enabling a more cacophonous debate. Listen carefully and one can hear the brainwaves of the ‘global imagination’, much as in Marjoljn Dijkman’s giant graphic digitization of eye and hand coordination. A billion synapses are firing off their message of a ‘globalised’ art community which is ostensibly no longer confined to the geography and exclusive citadels of Modernism. Our newest structures are more plantlike than concrete, glass or steel. They have offshoots, tendrils and nodules reaching seemingly everywhere. Our global networks are rearranging themselves endlessly, like Tintin Wulia’s pots of flowers configuring continent drift (Nous ne notons pas les fleurs, 2009-2015), and everyone is getting involved. Brook Andrew, Jumping Castle War Memorial, 2010. 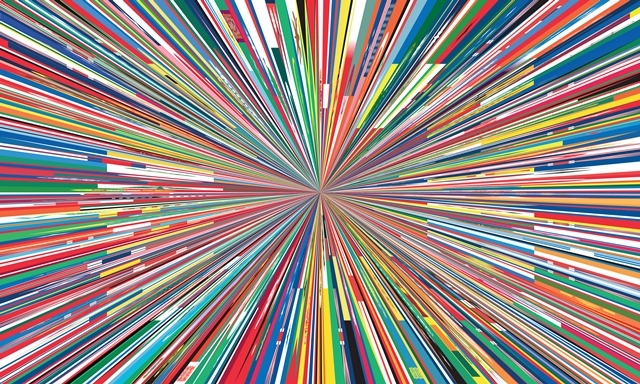 The global imagination dreams of an exploding marketplace with no fixed address or hours of business. We can contemplate it through the liquid mapping techniques animated in short films by Rivane Neuenschwander, or through the cut metal cooking pans and cylinders of Batoul S’Himi, or else dizzy ourselves in the Big Bang kaleidoscope of flags by Meschac Gaba before resting on Mona Hatoum’s woolly carpet, Shift. This imagination visualizes artists and their paymasters, critics and audiences as all joyfully nomadic, in jet-propelled free flow or parachuting freefall. Imagining globally means delighting at how biennials and artistic ‘exchanges’ are now so commonplace and proliferating that they have spread out as if to cover the whole known world. The old, bookish encyclopedias of knowledge – the exclusive art worlds of Europe and North America – have lost their spines, their pages creased and refashioned by visitors come to see Simryn Gill’s Paper Boats, while lost national histories have returned, as in Andrea Stultiens’ illustrations for the suppressed scholar of Uganda, Ham Mukasa. 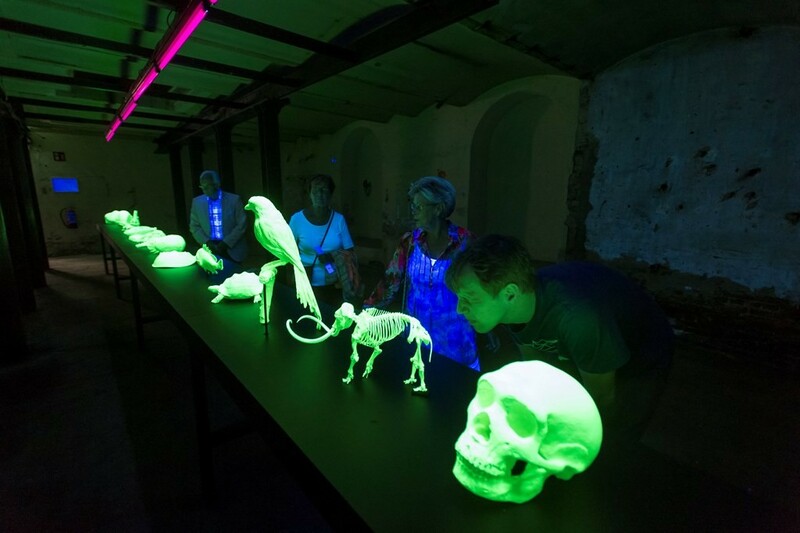 Mark Dion’s museological spoof, his The Natural Sciences, is a glow-in-the-dark taxonomy of the world’s same basic elements in three dimensions, scaled up or down by new-wave print technology for the convenience of public display – generating more fluorescent light than Enlightenment heat. The points on the art map from which these artists hail are interconnected, a profusion of bright lines tracking the world’s shuttling transmissions. In the global imagination, through all the glaring luminosity of our new-found mobility of capital, bodies, ideas, artworks, the Great Walls that once divided us can no longer be seen even from space. Mona Hatoum, Installation View, 2015. For most thinking people, however, something is seriously wrong with a world imagined in that way. It describes a globe that is as artificially cleaned up as the Leiden canal water machine processed by Lucy + Jorge Orta (Studio Orta) and drunk by thirsty visitors. Trailing quite close behind are a plethora of counterarguments and a certain pointed antithesis. These gloomy reminders of a far-from-global art environment are intoned routinely and warningly in much of the responding liberal discussion. Here the grim mood is set by Tsang Kin-Wah’s apocalyptic text animation riffing on the Fourth Seal, and the fire of entrapped villagers in ancient India, the daubing of crude oil, and the wasting of fossil fuels signaled by the Raqs Media Collective. 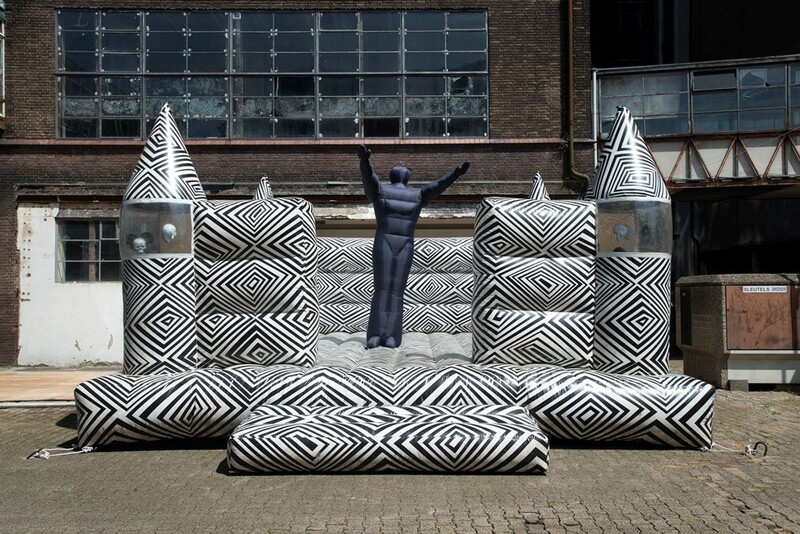 The issues are as black and white as Brook Andrew’s bouncy castle monument to the colonial genocide of Australia’s Aboriginals. These works underline a salutary clutch of messages. Always remember the asymmetries of power, the growing social and economic inequalities, and the ensuing and widespread existential misery! Grasp hold of the counter-myth to the inclusiveness of ‘global contemporary art’, whether that be the fiction of a single, world-encompassing ‘contemporary’, or the paradox that the particularities of art objects and practices may ever be focalized through such an ideological prism as ‘the ‘global’! Recognize that ‘discursive categories’ have become normative even for those who say they are thinking critically! Fix your attention on the concrete and irresolvable political, cultural and religious differences, the unfulfilled promise of cosmopolitanism, the fruitless dissensus of an art system that is less free-flowing than restricted, less unified than broken, more unjust and dystopic than emancipatory! Lament with Taryn Simon about the false universalism of access to the internet. Shudder with Femke Herregraven at how cleverly hidden are the giants of capitalism, invisible in their tax havens! Despair at the jarring incongruities and complexities of world economies and circuits of waste, the throwaway materials of consumerism carried about in the pretty plastic bags of Pascale Marthine Tayou! Join with the gentlemen-artist surrealist collective, Ghana Thinktank, in laughing behind the lens at the absurd hopelessness of Less Developed World solutions to the even more absurd problems of the More Developed World. Sneer with Romuald Hazoumè at the misplaced hope in non-governmental charity to save the poor, regardless of their skin colour! And whatever else you do: always, always be sure to register the contradictions. 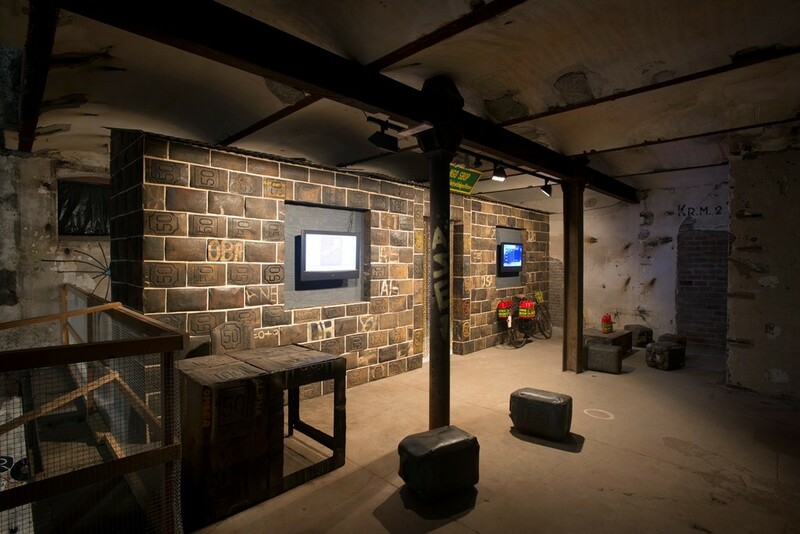 Mark Dion, The Natural Sciences, 2015. This play of opposites is of course just as much an imagined landscape as any other. Strictly speaking, it is produced less by a global imagination than by a dialectical one, which nonetheless operates on a global scale and on global issues. Whenever someone sets out the thesis of utopia (an idea of artistic creativity that is as boundless and energizing as globalization itself is reputed to be), then another voice soon clamours to speak up and register its opposition and to lay bare some brute facts. Without much commitment except to the principle of striving for a balanced discussion, through this exchange of views, agreement emerges. We all love an ‘on the one hand this’, ‘on the other hand that’ sort of discussion. Romouald Hazoumé, NGO SBOP, 2011. The final flourish of the dialectic imagination emerges in a third phase, generated from the synthesis of these two. This completes the path of its reasoning by wondering at the complexities of interplay and circularity. Observe those cases in which the utopianism of art and artists is co-opted and commodified by its very conditions of display, definition and circulation. Capital consumes art and few complaints can be heard after the ‘necessary trade off’ that artists and audiences make in order to survive or to benefit. (The dream of originality, let alone the search for it, can’t even begin without someone footing the bill). Here lies a landscape where social justice is pushed out of the way by the market system for art, which assigns its own values; equality is lost under the crushing weight of corporate multinational capital. Art museums have become global crime scenes and while the curatoriate is no less than an oligarchy of sinners, their authority depends on our regard for their artifice. Chen Zhen, Back to Fulness-Face, to Emptiness, 1997-2009. And so, in this way, liberal thinking draws the wistful conclusion that there are just too many of us involved for it to be clear who is to blame or to know which way to turn. The complicity of the art establishment, complicit in so much exploitation in the name of expressive and cognitive freedom, implicates even those who would take up a platform and raise a mirror to the circumstances, let alone raise the alarm. Commentators shake their heads and shrug their shoulders. Yet they feel comfortable that in their hard-worked explanations of the new world (dis)order of contemporary art, they have probably succeeded in summing everything up. There is not much else to be done. 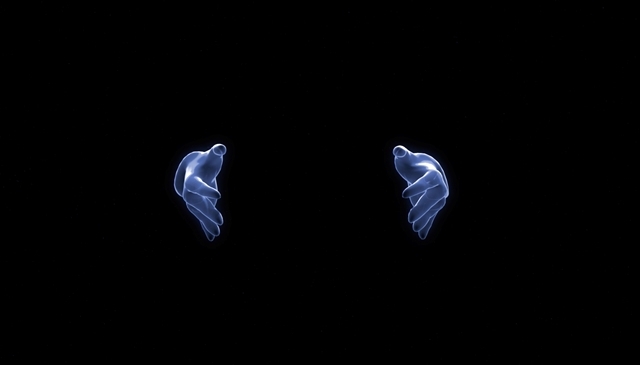 Marjolijn Dijkman, In Our Hands (video), 2015. The worst aspect of such dialectical imagining is that thought never quite leads to action of the kind that might promote social or political change. We stop short of destroying all these representations or at least troubling their bearing on reality by changing that too. We seem content to exert the power of explanation alone, and try to satisfy the abiding need for critical reflection, for that much-sought after ‘criticality’, for ‘dialogue’, for ‘open exchange’, for the quiet protest of theory, and the still, small voice of calm. A rather more homogenous than representative corpus of liberal discussants finds community with one another through inaction and therein lies relative happiness. The preamble to change is lengthy and deliberately so. It is rehearsed in automatic and sanctimonious fashion. Funny how well it sustains the careers of those who are paid to offer informed opinion on the state of the art. Where provocation and reassurance (those most unlikely friends) walk hand in hand, the theme that bubbles to the surface of discussion is always ‘civil society’. Here is a safe place where everyone is allowed to disagree deeply if they want to, but they are anyway supposed to be demonstrating a common purpose simply by participating in disagreement and a comparison of perspectives in the first place. If that place of participation may be called the expanding field of Art, then anyone whose life it touches is already working in a realm of shared values. The rumoured diversity and multiplicity of a ‘globalised’ art is just window dressing onto a more monolithic Art concept which orients all activity, enshrined in joined-up institutions, markets, laws on decency, etc. The assembly of Art’s members sits on the empty chairs that encircle the globe in Chen Zhen’s Back to Fullness, Face to Emptiness. It encompasses the myriad, stylized countercultures that carpet and paper the walls of an entire room by Georges Adéagbo. The title of that work reads like a call to arms for civil society and it deserves full quotation: “Who would take up defense and come defend us, if we had not taken up defense and defend [sic] ourselves…! Global imagination: The defense…!” Our society is imagined as global, and the grounds for its existence only defensible by virtue of our art. We sublimate our differences to the screen, the exhibition hall, the pavilion, the canvas, the temporal specificity of performance, the simultaneity of the web, the normativity of advances in digital hardware, the repetition of globalization as a curatorial touchstone. Whether the gates are truly open onto this civil society, whether everyone has the financial means to take part, the will do so, the appropriate apparatus of communication, the faculty to compute its codes of behavior, the geographical proximity required to be there, these are all matters that tend to get swallowed up in a more congratulatory chant about what ‘the global’ delivers. Civil society is the ideal that we can reach through art’s ambiguities, since its meaning is open-ended, multiple and pliable, so that art seen in this way corresponds to a flattering vision of ourselves as inherently compatible social subjects in a shared space of citizenship without borders. The Global Imaginations exhibition is the occasion to ask how to put an end to rehearsing such visions of creativity, participation, asymmetries of power, utopia and its contradictions, civil society, and so on and so forth, since continuing with such debates only has the result of deferring actual change. The exhibition seems to point to the question of how to admit that while much contemporary art discourse raises the starting gun for transformation, no one has yet pulled the trigger. If the first words of such a preamble on destruction were uttered in 1966, then they are being heard again now, and we ought to recognize the mantras that confine us to the art historical past. We need to ask whether we want anything to actually happen after the half century between Happenings and the global contemporary, and indeed what sort of imagining can sustain an alternative and more engaged future. Leon Wainwright is Reader in Art History at The Open University. He is the author of Timed Out: Art and the Transnational Caribbean (Manchester University Press, 2011), co-editor, with Beccy Kennedy and Alnoor Mitha of Triennial City: Localising Asian Art (Cornerhouse, 2014) and co-editor, with Oivind Fuglerud of Objects and Imagination: Perspectives on Materialization and Meaning (Berghahn 2015).